Didier Auriol (born 18 August 1958) is a French former rally driver. Born in Montpellier, and initially an ambulance driver, Auriol made his name as a French rally driver in the World Rally Championship throughout the 1990s. He became World Rally Champion in 1994, the first from his country to do so. He was a factory candidate for Lancia, Toyota and Peugeot among others, before losing his seat at Škoda at the end of 2003. At the age of 21, Auriol started rallying in an old Simca 1000. He drove the Simca 2 Years, then he got a Renault 5 Turbo, With this car, he drove in the French Rallye Championship. In 1986 he competed in a Metro 6R4. With this car, he won his first French Rallye Championship. He contested it again the following year, the first of the Group A years, in a Ford Sierra RS Cosworth and with his car he was French Rallye Champion 1987 and 1988. Auriol won his first World Championship event, the 1988 Tour de Corse, whilst driving a works Ford Sierra RS Cosworth. It was the only time that season when Lancia were beaten in a straight fight, and the Lancia team duly signed him for the following year. He remained with the team for four seasons, driving three successive versions of the then-dominant Lancia Delta Integrale. In 1992, driving the final evolution of the car, he won six events in one season (a record until beaten by Sébastien Loeb in 2005), but poor results on other rounds and retirement on the last event of the season, the RAC Rally, handed the world championship to Carlos Sainz. Auriol's Toyota Corolla WRC on display. In 1993 Auriol switched to Toyota, and won his first event for the team, the Monte Carlo Rally. He did not win again that season, but the following year he won the Corsica, Argentina and San Remo rallies and went into the final round, in Great Britain, vying again with Sainz for the championship. Despite a poor showing on the rally he emerged as World Champion after the Spanish driver went off the road on the final day. 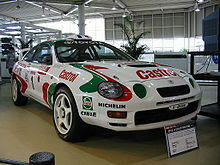 In 1995, he took the first win for the Celica GT-Four ST205 in Tour de Corse. However, later in the same season, on the Rally Catalunya, Toyota were found to have used an illegal device in the turbocharger to increase the power of the engine, and were excluded from the results of the 1995 championship and banned for next year. 1996 Auriol contested only two World Championship events. He drove for Subaru in Sweden and for Mitsubishi in San Remo. 1997 he entried in Monte Carlo with private Ford, and drove couple of rallies with Toyota's new Corolla WRC. Auriol drove for Toyota two next years, gaining two wins. When Toyota retired from World Rally Championship after 1999, Auriol moved to SEAT on board of the SEAT Córdoba WRC E2. With Auriol's experience, SEAT managed to grab the third podium place at the Safari Rally in Kenya, and later that season to launch their third evolution of the Córdoba WRC. However at the end of the season the Spanish manufacturer retired from WRC to focus on the development of a special series of high performance cars. Auriol still managed to deal with Peugeot for 2001 season, but in only asphalt-rallies where Auriol managed to be quicker than his teammate, Marcus Grönholm. Auriol's only win that year came from Catalunya. 2002 was kind of gap year for Auriol, but he made contract with Skoda team for 2003. Auriol was responsible for the development work of the Škoda Fabia WRC. Another notable achievement in Auriol's repertoire is being a six-time winner of the Tour de Corse, level record holder with Bernard Darniche. Even as late as 2001 Auriol was still racking up podiums there. Auriol's Toyota Celica GT-Four 1995 Tour de Corse winning car. Auriol with a Peugeot 206 WRC at the 2001 Rally Finland. Wikimedia Commons has media related to Didier Auriol.